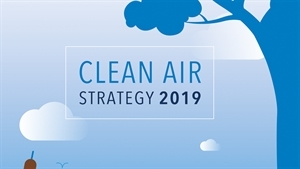 The Government has published a wide-ranging Clean Air Strategy with a focus on reducing people's exposure to five primary pollutants including particulate matter, which the World Health Organisation has identified as the most damaging pollutant. The strategy includes an 'ambitious, long-term' target to reduce exposure to fine primary particulate matter (PM2.5). The Government says that the initiative will cut the costs of air pollution to society by £1.7 billion every year by 2020, rising to £5.3 billion every year from 2030. The strategy adds to an earlier Government commitment to halve the number of people living in areas breaching WHO guidelines on particulates by 2025. The Government says that the UK is the first major economy to adopt air quality goals based on WHO recommendations, going far beyond EU requirements. The Government published an air quality plan for nitrogen dioxide (NO2) in 2017. NO2 is the other main emission of concern because of its health-related impacts and for which the road transport sector is the largest source. The strategy references a range of policies already announced for different sectors of the economy. It refers to the Road to Zero Strategy, published last September as a key driver of emissions reduction in the road transport sector. However, it says that air pollution does not just come from transport as it sets out a programme across other sectors including industry, agriculture and the household sector. With a commitment to end the sale of conventional new diesel and petrol cars and vans from 2040, the strategy reiterates the government aim to make the UK the best place to develop, manufacture and importantly use, zero emission vehicles. But air pollution does not just come from transport and the Clean Air Strategy sets out a programme of work across government, industry and society to reduce emissions coming from a wide range of sources. The Government says it will shortly bring forward an Environment (Principles and Governance) Bill which will include primary legislation on air quality, last updated in the historic Clean Air Act of 1993. Launching the Clean Air Strategy, Environment Secretary Michael Gove said: "While air pollution may conjure images of traffic jams and exhaust fumes, transport is only one part of the story and the new strategy sets out the important role all of us - across all sectors of work and society - can play in reducing emissions and cleaning up our air to protect our health." In response to the strategy the Chair of the EFRA Committee (a cross-party group of MPs) Neil Parish MP, commented on impacts of the plan across various sectors. On road transport he said: “We should not forget that inner city areas suffer the most with poor air quality. We would like to see the Government take stronger action against car manufacturers as part of any upcoming legislation to improve air quality". Friends of the Earth criticised the strategy for being 'severely lacking in detail'. While the group welcomes the ambition to reduce fine particle pollution to meet WHO standards it is critical that no target date for doing so is set. It also points to the absence of more detail or ambition in terms of NO2 standards. Related news: The Scottish Government has published a new National Low Emission Framework (NLEF). It is is an air quality-focused, evidence-based appraisal process developed to help local authorities consider transport-related actions to improve local air quality, where transport is identified as the key contributor to air quality problems. The main aim of the NLEF is to improve local air quality in areas where Scottish Air Quality Objectives (AQOs) are exceeded, or likely to be exceeded, and transport is identified as the key contributor. Important for transport, the NLEF confirms that Scottish Low Emission Zones will apply identical vehicle emission criteria, (Euro 4 petrol Euro 6/VI diesel) as both the Clean Air Zones (England) and London’s Ultra Low Emission Zone (ULEZ). The framwework also confirms the acceptability of accredited retrofits via the CVRAS scheme developed by the LowCVP with EST.